Mobile development is quite different from that of desktop programming. While planning to develop such software, you can pretty well assume that most of the users will have higher internet speed. They are even using larger screens and keyboard and mouse for interact with pages. Developers, planning to move from desktop to mobile development, can often make these mistakes, when they are new in this field. Some simple mistakes can easily degrade the android apps performance. If you don’t want Poor Performance of Android Apps , try avoiding the issues from the first. While dealing with cloud, developers assume users to stay well-connected to internet for accessing app. Avoid assuming that users will have high bandwidth access instantly with mobile app. If you plan to create API call or use any remote server, it might cause the app to hang. Users might not know that short hangs in app can mean something is processing in the background. While checking your app for network performance or making a call to API, ensure to use asynchronous threads and cause for performing background action while allowing users to use the app. This might avoid user confusion and will prevent the dialog box, saying “Application not Responding” from displaying. One of the major issues is associated with memory management. Apps can work on various threads and soak memory resources. Or, it might run on the system with various apps, already open. People write code as if only their apps exist. The software needs to be a good citizen in the app ecosystem. Some apps are looking like a gig of data. They are archiving news from the previous month. There is also a level of corporate citizenship, which must be there on the mobile app. While focusing on the scalability and performance of the app, there are some network issues driving users and developers mad. The issues are based on bandwidth and network latency, issues with direct impact on app performance mostly on cloud and mobile, variant bandwidth with increased latency and packet loss and more. Another issue is DNS query making up most of the web traffic for causing trouble for visitors. As a solution, you have to monitor app performance and network bandwidth for various locations to help isolate problems to network tier. It is hard to break from standard development practices. For years now, developers have optimized UIs for mouse and keyboard input. However, it is entirely different in the mobile sector. Users tap fingers and type with thumbs. The UI components might make it easier for a user to type value and then tap to move to next element. UI elements need to be easier and larger for users to tap with fingers. Having 20 items is not a clever idea. Menus must have options, which are easier to find and should require minimal scrolling. The input components need to be easier to tap and ensure selection. Font sizes need to be large for users to see. Proficient app development with constant new releases might open the door with a minimum product, which will improve with time. But a loss of traditional software cycle might give rise to complications mainly because of dependencies on third party APIs and OS. Sometimes APIs might use techniques, which are tricky like iOS method swizzling and might introduce unexpected modifications. 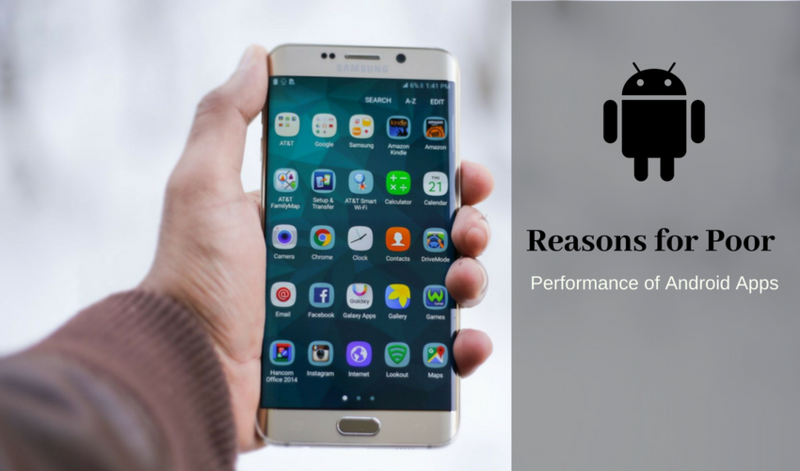 These five are the major reasons leading to poor performance of the android applications. So, the Android app development company should pay heed to these issues first before creating their next big Android application project. It helps in addressing issues from the core and finds relevant solutions to it. Patrick Mostler a android app developer working with mintlogix, a android app development company. He has an excellent command on how to deal with different app development issues, and likes to provide tips & tricks for mobile marketing, finding a best mobile app design tools, finding error with their solution for application etc.